Apple’s chief executive Tim Cook has gone on a media tour and as a part of that comes an extremely interesting interview with NBC. You might have watched it live, or you might have seen snippets of it, just published on NBC’s website. And now the full interview with Tim Cook is up on YouTube, even earlier than NBC officially posted it. While we are still waiting for the official release though, you can take a look at the full interview if you missed it when it aired around 10pm ET tonight. In it, the Apple CEO speaks about Steve Jobs, how Apple changes and tries to remain relevant through times, and about an “intense interest” in TV. You can find the full interview right below, divided in two parts. What is that smell?..... Ahhh that's desperation.. CEO going on a "media tour " relight. Desperation at its worst. 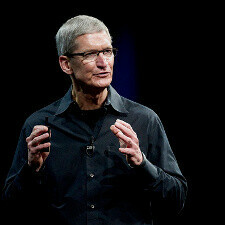 He is trying his hardest to give reasons behind the product no longer moving forward after Steve Jobs going. Along with the plethora of issues and failed attempts by Apple since he left. The ship is sinking people is DEAD obvious. Get out while you can!!! I have always wondered how far smartphones would be right now, had it not been for the iPhone. It's all about the cost of wages, regulatory overhead, cost of real estate/physical plant and taxes (payroll, property).